Yanky Fachler speaking to the Irish Jewish Historical Society on April 8th 2013 on the occasion of Yom HaShoa. The Warsaw Ghetto was established in October 1940. Jews in Warsaw and its suburbs were rounded up, and 400,000 people, about 30% of the population of Warsaw, were squeezed into the Ghetto that was about 2.4% the size of Warsaw. Over 100,000 Ghetto residents died due to rampant disease or starvation, as well as random killings. Between Tisha Be’Av (July 23) and Yom Kippur (September 21) 1942, about a quarter of a million Jews were deported from the Ghetto and murdered in the Treblinka death camp. The Jewish Combat Organization(Zydowska Organizacja Bojowa – ZOB) was an anti-fascist alliance formed by Socialist Zionist youth groups Hashomer Hatzair and Dror Hehalutz, and the General Zionist youth group, Akiva. They were soon joined by the other Socialist Zionist youth groups in the ghetto, as well as by the anti-Zionist Socialist Bund, and the communists. The glue that kept ZOB together was a shared hatred not just of the Nazi occupiers, but of another Jewish resistance group, the Jewish Military Union (Zydowski Zwiazek Wojskowy; ZZW). The ZZW was created by the Revisionist Party – the right-wing Zionists who were followers of the credo of Zeev Vladimir Jabotinsky. 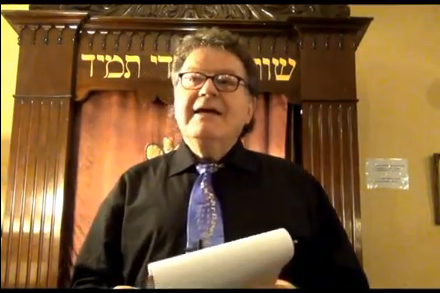 Below are the two recorded extracts of Yanky Fachler presenting the story of the Jewish Flag that flew over the Warsaw Ghetto during the uprising in 1944. The lecture was delivered on the occasion of Yom HaShoa this year and is part of an ongoing series of presentations by Historians and Broadcasters, in association with the Irish Jewish Historical Society. We would like to acknowledge the work of Clontarf Media in Dublin who digitally recorded this event. On January 18, 1943, German SS and police units tried to resume mass deportations of Jews. A group of Jewish fighters, armed with pistols, infiltrated a column of Jews being forced to the transfer point and, at a prearranged signal, broke ranks and fought their German escorts. Most of these Jewish fighters died in the battle, but the attack sufficiently disoriented the Germans to allow the Jews arranged in columns a chance to disperse. The Germans suspended further deportations for 3 months, during which time ZOB and ZZW built subterranean bunkers and shelters. The Germans planned the final liquidation of the Warsaw ghetto for April 19, 1943, the eve of Passover. When Waffen SS and police units entered the ghetto that morning, supported by a tank, the streets were deserted. Nearly all of the residents had gone into hiding places or bunkers. The renewal of deportations was the signal for an armed uprising within the ghetto – the Warsaw Ghetto Revolt, the first uprising against the Nazis in World War II. That day, the Germans fled in panic.